Oops - we don't appear to have a video for the WorkForce DS-410. The DS-410 has a robust build to handle everything office life can throw at it, and a very compact body to take up minimal desk space, so it's easy to fit into even the smallest of offices. 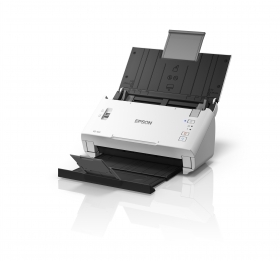 It can scan at speeds of up to 26ppm/52ipm, and handle paper weights from 50g/m² to 209g/m². Also, manual A3 mode allows ad-hoc scanning of larger-format originals. The scanner is bundled with Epson’s new Document Capture Pro 2.0 software, which offers a simple but powerful software solution for scanning, separating and routing documents throughout a business.